Start off the new year with a trendy new set from ArteStile! ArteStile professional beauty tools are uniquely designed with a patented baked enamel finish for an exceptional in-hand feel. 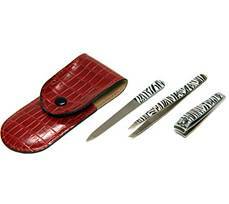 Professional nail Trims, Files, Scissors, and Tweezers are hand-crafted in Italy of the finest stainless steel. The tips and blades are perfectly aligned and hand-filed for lasting performance. ArteStile is definetly a company to check out if your looking for high quality/sturdy beauty tools. Plus they are based in Canada! Please check out my ArteStile post for high quality pictures of my favourite set. They are offering this adorable zebra print set to ONE lucky Spiced Beauty reader! This giveaway is open to USA & Canadian residents!